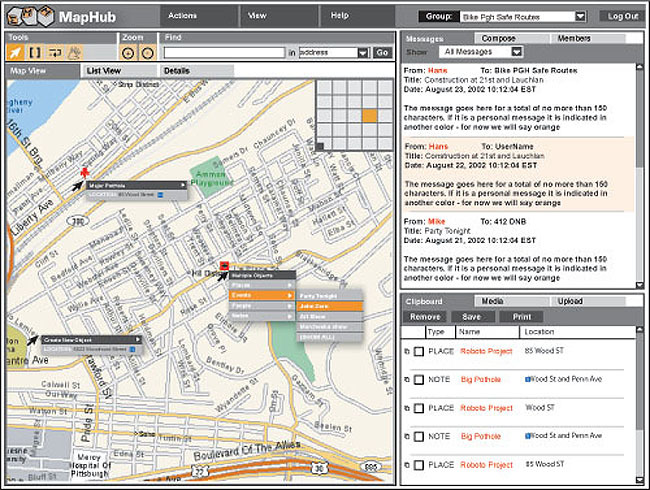 MapHub is a web-based, multi-user, group managed information storage system and map. The goal of fellows Carl DiSalvo, Jeff Maki and Nathan Martin was to collect information about people, places, events, and notes, and help document unseen narratives and histories in public or private theme-based hubs. 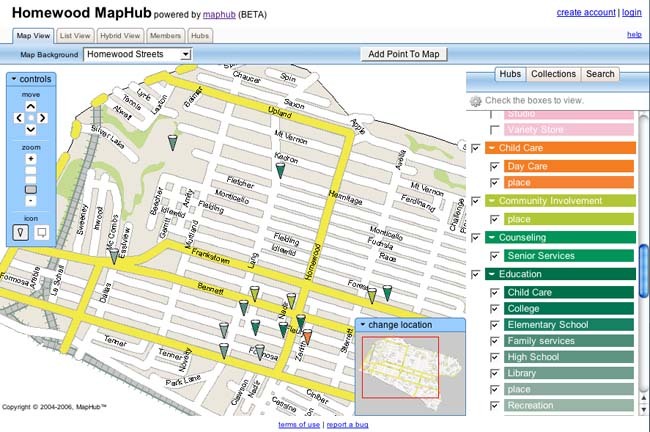 MapHub researched the introduction of a geographic and historical data sharing application in an urban landscape. MapHub is a peoples’ map – a map of an urban geography determined not by traditional methodology but instead by the members who participate and contribute everyday in the experience of urban life. MapHub is both a tool and a platform that gives users pen and paper to record their unique and situated perspectives and then deliver that documentation to others. The web-based software facilitates individual spatial and temporal narratives managed and distributed through a simple social network. Based on a Geographic Information System (GIS) backend built on open source packages, MapHub manages data as visual symbolic objects specific to hubs organized thematically. Aside from having a personal hub based on immediate to distant social or participant networks, alternative hubs based on themes such as health code violations, past job experiences, etc. For example, the project team worked with Bike Pgh to design a system that would help promote safe bicycling in the city of Pittsburgh. This work continues at DeepLocal, a startup company founded by the MapHub project co-directors.